Cindy has been working at the Champaign Goodwill part time for two years and sees herself working there for quite a while. 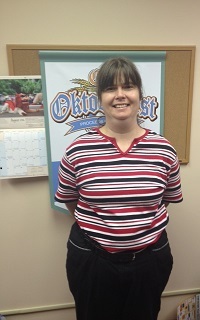 She said that she enjoys working with everyone there and enjoys the team and supportive environment. When not at work, she can be found hanging out with her friends and her boyfriend. They enjoy hanging out together at some of their favorite places like Za’s, Original Pancake House, Buffalo Wild Wings, and Carmike Theater. Cindy enjoys listening to music and writing poetry. She also likes to cook, and noted that her favorite summer dish to make is her signature pasta salad. From time to time she makes bracelets and necklaces for herself, which others may purchase if interested. Cindy and her mom are writing a book together about her life growing up and hope to someday have it published. Cindy is originally from California and would love the opportunity to travel back there one day to visit with her uncle in Redlands. Cindy and her uncle share a special bond and Cindy shared that it has been “too long” since she got to visit him.